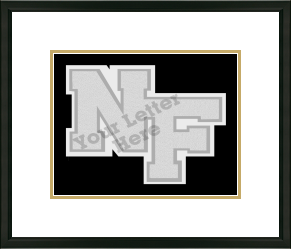 Design a custom frame for JV or Varsity Letters You can select the frame moulding and matting colors. You can even add an embossed insignia and/or your class year or a personalized engraved plate. Professional-quality framing will protect your hard-earned varsity letter against incidental damage from handling and provide a long-term environment that will maintain your letter's appearance. Get started by selecting the shadowbox moulding and mat colors that will create a perfect showcase for your letter. We will make your frame custom-to-order with an easy open back and step-by-step instructions so you can easily insert your own letter and pins. A varsity letter frame is a great gift to showcase your athlete’s milestone achievement.